Deep inside the vaults of the British Library are stored thousands of theatre playbills. They are a lively record of the plays being performed in theatres up and down the land during the years after Shakespeare died. 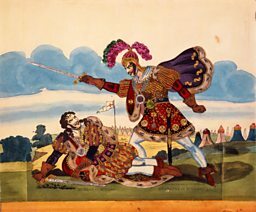 Around 30,000 of the 250,000 or so playbills kept by the British Library are now digitised. 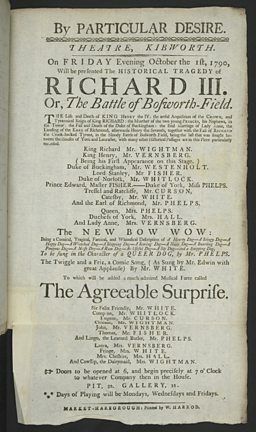 The playbill above (not digitised) from October 1, 1790, records the performance of Richard III in Kibworth, Leicestershire, not far from the city of Leicester. The performance promises ‘historical passages’ for the enlightenment of this late-18th century audience. By PARTICULAR DESIRE. THEATRE, KIBWORTH. 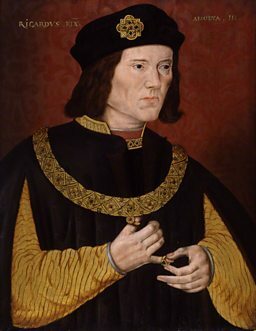 On FRIDAY Evening, October the 1st, 1790, Will be presented The HISTORICAL TRAGEDY of RICHARD III. Or, The Battle of Bosworth-Field. THE Life and Death of KING HENRY IV. The artful Acquisition of the CROWN, and Tyrannical Reign of King RICHARD : the Murder of the two young PRINCES, his Nephews, in the Tower: the Fall and Death of the Duke of Buckingham : the fatal Marriage of Lady Anne, the Landing of the EARL of Richmond, afterwards Henry the Seventh, together with the Fall of RICHARD the Crook-backed Tyrant, in the Bloody Battle of Bosworth Field, being the last that was fought between the Houses of York and Lancaster, with many other Historical Passages are in this Piece particularly recorded. But Shakespeare’s version of Richard III portrays him as a ‘crook-backed tyrant’ – despite the facts about the monarch appearing far less clear-cut. Shakespeare’s ‘Richard’ can be courageous and witty, but we are left in little doubt that the monarch is seen as a charismatic villain who betrays and murders his way to power. Yet the ‘real Richard’ also passed legal reforms to protect ordinary people – such as a system of bail, and an affordable justice system. Benedict Cumberbatch will be the latest in a prestigious line of actors to play Richard III. He follows in the footsteps of a host of famous Richards including John Philip Kemble, Edmund Kean and more recently - Laurence Olivier, Ian McKellen and Al Pacino. In 2015 the remains of the real Richard III were famously discovered, identified and reinterred at Leicester Cathedral. It was an event which sparked lively debate about the character and reputation of the monarch. The service was attended by dignitaries, and the actor and distant relative of the Yorkist King, Benedict Cumberbatch, gave a poetry reading. 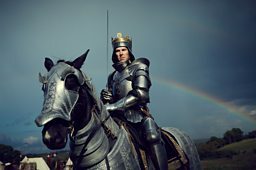 This year the actor will bring his own unique interpretation to the role, as “The Hollow Crown” returns to the BBC with Cumberbatch as Richard the Third. From the moment they were written through to the present day, Shakespeare’s plays have continued to enthral and inspire audiences. They’ve been performed in venues big and small – including inns, private houses and emerging provincial theatres. BBC English Regions is building a digital picture which tracks some of the many iconic moments across the country as we follow the ‘explosion’ in the performance of The Bard’s plays, from his own lifetime to recent times. Drawing on fascinating new research from Records of Early English Drama (REED), plus the British Library's extensive collection of playbills, as well as expertise from De Montfort University and the Arts and Humanities Research Council, Shakespeare on Tour is a unique timeline of iconic moments of those performances, starting with his own troupe of actors, to highlights from more recent times. Listen out for stories on Shakespeare’s legacy on your BBC Local Radio station from Monday 21 March, 2016. ... but was the great man with them? A magnet for Lincolnshire entertainers, royalty and even Shakespeare himself? Caludon Castle: Did Shakespeare perform here for ‘Henry the Harmless’? Was Shakespeare there during the 1593 'Plague Tour'?